For over 65 years, the Photoelectric beam sensor has stood for quality and reliability. Photoelectric beam sensor is the professional supplier of choice for innovative technology, backed by the accurate detection. 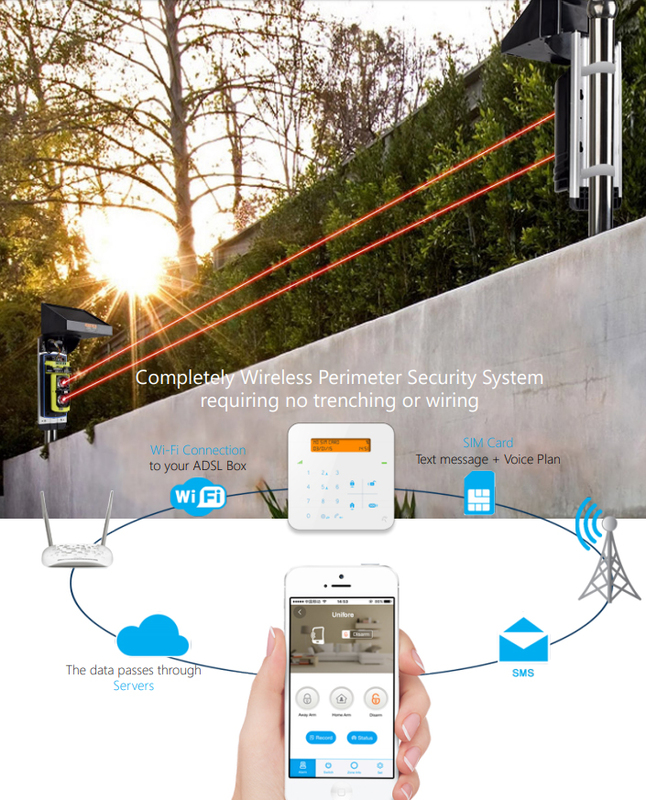 Now, Unifore is delighted to present you new “Sensor” series solar powered wireless photoelectric beam sensors which allow you to setup completely wire-free, portable, energy saving and super-easy to install wireless perimeter security systems. Sensor series photoelectric beams combines wireless technology and active infrared detecting technology together, it has built-in high power wireless radio communication module to communicate with alarm controller/panel, it leverages dual active infrared beam can offer accurate motion detection not compromising to flying birds, swaying tree branches, moving small animals. The application for it is so abroad, it can be used for any perimeter solution which requires no trenching or wiring. It’s the best product to secure your swimming pool, driving way, warehouse, residence, construction building, farm, remote electrical substation and more. Photoelectric beam sensors can cater the need for both indoor and outdoor perimeter fencing applications. The product has built-in a high power communication module which has the capability to transmit signal up to 200 meters. The signal can travel wall/blocks to reach the controller. It increases the flexibility when you decide to place the alarm panel. A completely wire-free solution is assured, because we provide an advanced smart alarm panel to work with it, the smart alarm panel supports wireless Wi-Fi and cellular communication, hence you’re able to get notified no matter where you’re. Solar panel supplies power to the detector, it’s eco-friendly and you pay zero fee on running it, also make contribution to environment protection. It has a super long-life LiFePO4 battery (500mA capacity) can store power and its life expectancy reaches up to 7-8 years. Just requiring two day’s direct sunlight, the battery can be fully recharged, its power can make sensor work up to 30 days when it encounters continuous cloudy/rainy days. Unlike conventional photoelectric beam detectors, new SENSOR series photoelectric beam sensors are IP65 weatherproof design, can withstand rain, wind, snow, dew, frost. The photoelectric beam cover utilizes special engineering plastic material can not only shield UV, but also can withstand vandalism. The photoelectric beams are mounted on durable aluminum material bracket, it’s light-weight and extremely durable. Both transmitter and receiver has tamper switch design, any tampering will set off the alarm immediately. In addition to work with alarm controller, the SENSOR new series photoelectric beam detectors also can work with smart HD camera together. When working with smart HD cameras, the system can automatically record video when perimeter photoelectric beam was interrupted, can send instant push notification to notify users. You’re able to watch HD live video anywhere anytime when you’re away. You’re able arm/disarm alarm function via app.The camera is compatible with ONVIF and RTSP protocols can broadcast video stream to different hardware and software clients such as digital network video recorders, video management software, video surveillance server and centre. LINK: Smart cameras can work with this solar beam. Say goodbye to complicated installation, wireless makes it super easy to install. The product adopts wireless enrolling technology, it makes sensor enrollment is straightforward. No need to hire security installer, you are able to setup and install it by yourself. Moreover, it supports seamlessly smartphone App integration. You can setup system and control it via app. The app supports remote firmware upgrading to let you have a solid system featuring the latest functions. Once intrusion happens, the control panel can send instant push notification alert, can call five preset phone numbers or send text message (SMS) if it has been inserted a SIM card. In addition to self-monitoring, it also can communicate with alarm monitoring centre via universal ADEMCO Contact ID (CID) protocol. If you want to pay monitoring fee to local security company.